The 1974 FIFA World Cup, the tenth staging of the World Cup, was held in West Germany. Some of football’s most successful nations did not qualify, including 1966 champions England, France, hosts of the 1970 tournament Mexico, Spain, 1966 third-place finishers Portugal, Belgium, Czechoslovakia, Hungary and Romania. 16 teams qualified, divided into four groups of four. Each played a round-robin with two points for a win and one for a draw, and goal difference used to separate teams level on points. The top two teams from each group advanced to the next stage. However, in a change from the format used in the previous five competitions, the second round consisted of another group stage: the eight remaining teams were divided into two groups of four. The winners of each group played each other in the final, and the second place teams in each group played each other in the third/fourth place match. The tournament was held mostly in bad weather, and the stadia had few protected places. Few western European nations had qualified, of which only The Netherlands, West Germany and Sweden made it past the Group Stage. 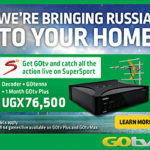 Fans from the Eastern neighbour states were hindered by political circumstances. Two teams made a particularly powerful impact on the first round. The Netherlands demonstrated the “Total football” techniques pioneered by the top Dutch club Ajax, in which specialised positions were virtually abolished for the outfield players, and individual players became defenders, midfielders or strikers as the situation required. The Dutch marked their first World Cup finals since 1938 by topping their first-round group, with wins over Uruguay and Bulgaria and a draw with Sweden. Sweden joined the Dutch in the second group round after beating Uruguay 3–0. Poland, meanwhile, took maximum points from a group containing two of the favourites for the tournament. They beat Argentina 3–2, trounced Haiti 7–0, then beat Italy 2–1 – a result that knocked the Italians out of the Cup and resulted in Argentina sneaking to the second group round on goal difference. While Haiti didn’t do particularly well in their first World Cup finals (losing all three of their games and finishing second to last ) they did have one moment of glory. In their opening game against Italy, they managed to take the lead with a goal from Emmanuel Sanon, before eventually losing 3–1 (Italy had not conceded a goal in 12 international matches). That goal proved to be a significant goal as it ended Dino Zoff’s run of 1142 minutes without conceding a goal. Group 1 contained both East Germany and the host West Germany , and they both progressed at the expense of Chile and newcomers Australia. The last game played in Group 1 was also the most anticipated, a big clash between the two German teams. 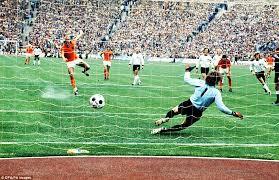 West Germany was already assured of progression to the second round whatever the result. In one of the most politically charged matches of all time, it was the East that won, thanks to a late Jurgen Sparwasser goal. This embarrassing result forced a realignment of the West German team that would later help them win the Cup. 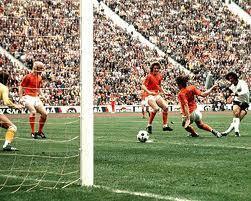 In Group A, two goals from the inspirational Johan Cruyff helped the Dutch side thrash Argentina 4–0. At the same time, Brazil defeated East Germany 1–0. The Dutch triumphed over East Germany 2–0 while in the “Battle of the South Americans”, Brazil managed to defeat Argentina 2–1 in a scrappy match. Argentina and East Germany drew 1–1 and were on their way home while the crucial match between the Netherlands and Brazil turned into another triumph for ‘total football’, as second-half goals from Johan Neeskens and Cruyff put the Netherlands in the final. However the match would also be remembered for harsh defending on both sides. The final was held on 7 July 1974 at Olympiastadion, Munich. West Germany was led by Franz Beckenbauer, while the Dutch had their star Johan Cruyff, and their Total Football system which had dazzled the competition. With just a minute gone on the clock, following a solo run, Cruyff was brought down by Uli Hoenes close to the German penalty area, and the Dutch took the lead from the ensuing penalty by Johan Neeskens before any German player had even touched the ball. West Germany struggled to recover, and in the 26th minute were awarded a penalty, after Bernd Holzenbein fell within the Dutch area, causing English referee Jack Taylor to award another controversial penalty. Paul Breitner spontaneously decided to kick, and scored. These two penalties were the first in a World Cup final. 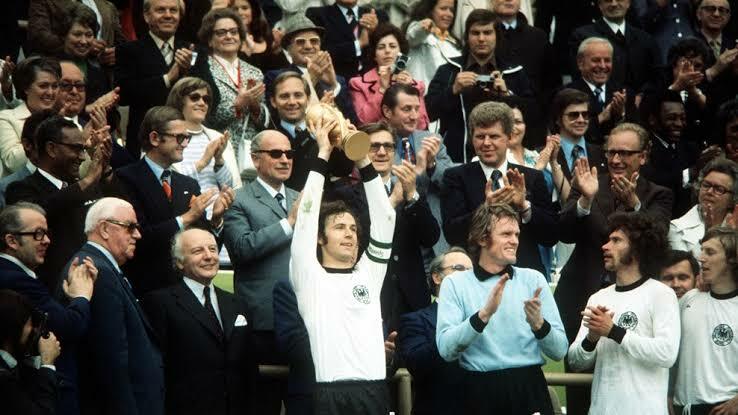 West Germany now pushed, and in the 43rd minute, in his typical style, Gerd Muller scored what turned out to be the winning goal, and the last of his career as he retired from the national team. The second half saw chances for both sides, with Müller putting the ball in the net for a goal that was disallowed as offside. In the 85th, Hölzenbein was fouled again, but no penalty this time. Eventually, West Germany, European Champions of 1972, also won the 1974 World Cup. Joao Havelange former FIFA President from 1974 to 1998) claimed that the 1966 and 1974 World Cups were fixed so that England and Germany would win respectively. This was only the second time that a team had won the World Cup after losing a match in the Finals (West Germany losing to East Germany during the group stage). The previous occasion was West Germany’s earlier win in 1954. 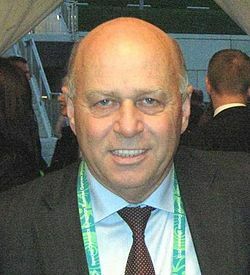 Poland’s Grzegorz Lato led the tournament in scoring seven goals. Gerd Muller’s goal in the final was the 14th in his career of two World Cups, beating Just Fontaine’s record of 13, in his single World Cup. Müller’s record was only surpassed 32 years later, in 2006 by Ronaldo’s 15 goals from three World Cups and then 8 years after, in 2014 by Klose’s 16 goals from four World Cups. Gunter Netzer who came on as a substitute for West Germany during the defeat by the East Germans, was playing for Real Madrid at the time: this was the first time that a World Cup winner had played for a club outside his home country.